Pesticides, Insecticides, Fungicides and Herbicides are used in agriculture, forestry, animal husbandry, commercial centres and houses for the pest control. India's pesticide industry is the largest in Asia and the twelfth largest in the world and it has grown by 7.6 per cent during the last 20 years. During last 35 years, consumption of these products has increased manifold and industries are coming up throughout the world due to its increasing demand. Crops receiving the most intensive application of various pesticides were cotton for insecticides, corn for herbicides, and fruits and vegetables for fungicides. Examination of use trends of pesticides indicates that the volume in pounds of herbicides used on crops is increasing, whereas the quantities of insecticides and fungicides remain stable. The increased usage of pesticides, together with knowledge of some of their adverse effects, has alerted the public to the need for regulation. The insecticide usage is high in India because weeding is done manually in India and tropical climate of India which leads to greater incidences of insect infestations. Insecticides have a higher market share in India contrary to the global market where herbicides and fungicides have higher market shares. This book majorly deals with specification of pesticides, fungicides, permeability of liquid fumigants through polyethylene, insecticidal properties of deoxygenated and chlorinated shark liver oil, methods of determining chemical and physical properties, spectroscopic methods for determining the purity of products. This book also contains formulae, manufacturing process, infrared and ultraviolet spectra of seventy six pesticides and so on. The book contains formulae, processes of different types of pesticides, insecticides, fungicides and herbicides. This book will serve as a guide to research scientists, industrialists, policy makers and students. Polyethylene films are used as fumigation sheets for bagged commodities, soil treatments, and disinfesting buildings. They have been used as laminates with other flexible packaging materials for dispensing volatile disinfectants. Data are available on the permeability of volatile chemicals through polyethylene films. Loss of methyl bromide (MB) through polyetheylene vinyl films and synthetic rubbers or materials coated with them have been reported. Elaborate apparatuses have been employed by various workers to test permeability have used a metal jar with a flanged mouth. The liquid, of which the vapour permeability is to be tested, is placed in the jar and the material to be tested is clamped on to the flanged portion using a brass ring. Loss in weight due to vapour loss is determined by periodical weighings. Evaluate organic vapour transmission of films using two 125 mm. crystallizing dishes one inverted on top of the other with the test film sandwiched between the two. Methyl furoate is kept in a glass vessel suspended from the top chamber. The lower vessel contains potassium hydroxide. The methyl furoate passing through the film gets saponified to the potassium salt of furoic acid which is determined by spectrophotometer. Some use a stainless steel permeability cell connected to a high vacuum system and determine the permeability constants. Constants for ethylene oxide and methyl bromide have been determined this way. But no easy and quick method is available for routine screening of materials for use as fumigation sheets. An attempt made to develop a simple and rapid method of screening polyethylene films is reported. Technical grades of ethylene dibromide (EDB), ethyl formate (EF) and chloropicrin (CP) were employed as test fumigants. All these three chemicals are liquids at ordinary temperatures. Low and high density polyethylene films from 0.001 to 0.01 in. thickness (100 to 1.000 gauge) were tested in pouch form. Two experiments were done for carrying the fumigants. (i) Sealed thin glass ampoules containing 5 ml. (10.860) of EDB and having a constriction for easy breakage were rolled inside blotting paper. The open ends of the paper were folded-in and boss-stitched. These were placed inside polyethylene pouches and heat sealed. The average film area enclosed by the seams was 86 sq. cms. for the entire pouch, (ii) EDB, EF and CP absorbed to saturation points in asbestos discs of 2.4 cm. diameter and 0.2 cm. thickness were placed inside pouches of polyethylene and sealed. The average area exposed to vapours was 36 sq. cms. within the scams. This method can be used as an alternative one where ampouling of fumigants may offer difficulties. The fumigant vapours were at saturation concentration in the atmosphere of all the pouches. After noting the initial weight in a Mettier balance, the pouches containing the EDB in glass ampoules were given enough pressure to break the glass ampoule at the constriction inside, taking care not to damage the film material. This operation released the EDB liquid on to the blotting paper which absorbed the liquid and started desorbing to the film surface from where absorption and diffusion to the outer surface started. The pouches were weighed at the end of 5, 10, 20, 30 and 60 minutes from the time the ampoule was fractured and the loss in weight recorded. The progressive loss in weight was plotted against time on a graph paper (Fig. 1). The experiments were done at 25Â°C. The weight losses were also noted at the end of 24 hours and are expressed as per cent loss over the quantity initially ampouled (Table-l). In the case of pouches containing the asbestos discs saturated with EDB, FE and CP the initial weight was noted as soon as the seals were made and weighed progressively as before. The transmission was observed at 30Â°C (room temperature) and 37Â°C in a constant temperature room. The loss of vapours is expressed as gms. of fumigant per square meter in one hour (Table-II], after a constant rate of loss was recorded. Table 2: Transmission of fumigants through polyethylene pouches at 30Â°C and 37ÂºC. The progressive losses in weight plotted against time showed a linear relationship (Fig. 1) with most gauges of films tested with EDB in glass ampoule. The lines showing transmission rates became more horizontal as gauge increased. The black variety of polythylene film was not better than its transparent counterpart. Very rapid transmission rates were recorded at the lower gauges (100-300) and the linear relationship was disturbed, probably due to quicker saturation and desorption from the thinner cross-section of the films. 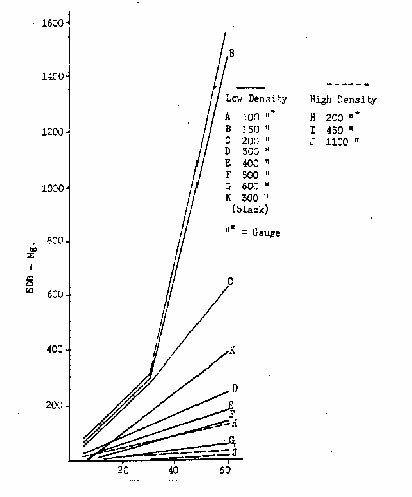 The high density films showed much lower transmission rates at comparable gauges. The 200 gauge high density film lost only 127 mg of vapour compared to 629 mg. by its low density counterpart. In other words a 200 gauge high density film was approximately 5 times more efficient than a 200 gauge low density film. The figures for loss of EDB in 24 hrs. (Table l) show that loss of vapours ranged from 100% in 100 gauge to 37% in 600 gauge in the low density series. In the high density series the gauges of 450 and 1100 showed remarkable resistance to vapour loss showing only 16% and 30% respectively. In tests at temperatures of 30Âº and 37Â°C with EDB, EF and CP absorbed in asbestos discs the transmission through the pouches increased with temperature, as expected. Between EDB, EF and CP the transmission was more with EDB probably due to its greater affinity for polyethylene. Better vapour retention was shown by the high density polyethylenes. The study has also shown that the low density polyethylene sheets transmit fumigant vapours at a high rate. The thickness of films recommended for fumigation are 400-500. Even methyl bromide fumigations are done under polyethylene sheets. This fumigant which has much more affinity for polyethylene and a very high vapour pressure (182-1- mm Hg. at 25ÂºC) would escape at a faster rate at temperatures obtaining in India, though at cooler climates this may not be a so apparent. The high density polyethylene, offers scope for use as gas-proof sheet in fumigation due to very low rates of transmission. The EDB in glass ampoules packed in polythylene could be used for small-scale fumigations after breaking the ampoule by pressure. Even methylbromide dissolved in ethylene dibromide could be ampouled and dispensed this way to have a more insecticidal and penetrating fumigant for pest control operations. Controlled transmission of vapours could be obtained by varying the thickness (gauge) of the film. Contact of liquid fumigants with men and material could be avoided. The work reported is also useful in working with the problem of in-package fumigation for the selection of proper packaging materials.